“The liberation of Mosul has come at an incredibly high cost” – Human Rights Watch. Mosul has been a killing field for innocent children, women, and men caught in the crossfire between the Iraqi military and ISIL. Maulid Warfa, an Iraqi UNICEF official reporting from Erbil, Iraq, expressed how a woman with four of her children entered the Central Hospital in Western Mosul. Her hands were covered with blood as she was holding her baby, who was bleeding profusely from his arm. She was trying to stop the bleeding. Her situation is just one of many that include innocent civilians horrifically maimed and/or killed. According to Warfa, “The people, specifically the children, have paid an extremely, terrible price from the fighting in Mosul. They have witnessed a horror and a nightmare”. Reporting from New York, Farhan Haq, Deputy Spokesman for the Secretary General of the United Nations, expressed that the people of Mosul have not had their rights respected. “We don’t want any attacks to target civilians.” 500 families were alleged to be displaced from West Mosul, and there have been repeated international law violations by pro-government forces. Haq stated that there needs to be accountability for the civilian killings. He expressed that the UN is prepared to help with the re-establishment of the rule of law in Mosul, that humanitarian aid will be given, and that the UN High Commission of Human Rights will help to ensure that there are no reprisal killings. George Butler, artist and illustrator, who has traveled to Syria and Iraq to document the suffering of the people, concurs with Warfa’s description. Butler expressed the ominous and expansive suffering of civilians in Mosul, Iraq. According to Amnesty International, it has been documented that approximately 5, 805 civilians were murdered in four months. Butler reported, “I found huge destruction to civilian life.” He also reported countless homes destroyed in airstrikes and mosques having been laid waste. The victims were not fighters or government opposition, but innocent civilians. Yes, Daesh are being killed, but countless innocent lives were extinguished along with them. Butler states the best drawings he did were the ones he was emotionally attached to and with the permission of the victims. His desire was to draw exactly what was in front of him to share with the world. Another view of the carnage in Mosul was offered by Russian foreign minister Sergey Lavrov at an informal Summit for the Organization of Security & Cooperation (OSCE) held in Europe. Lavrov spoke about the over 1 million refugees who had already fled Mosul which outnumbered those fleeing Aleppo, Syria. 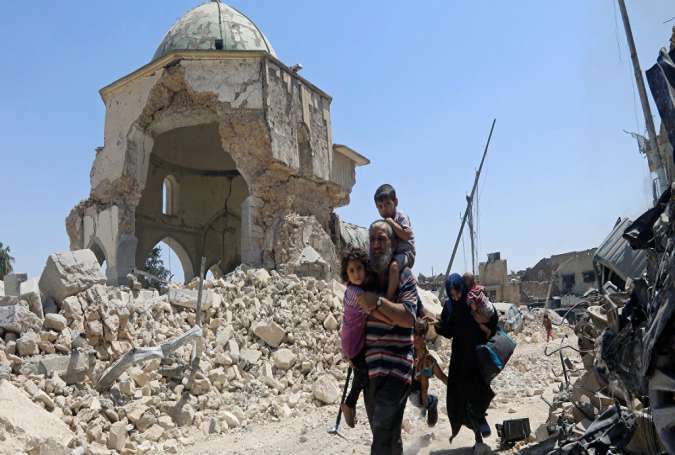 He reminded journalists that the sufferings and departures of civilians from Mosul were spontaneous and chaotic in contrast to those who left Aleppo in a planned and organized fashion. He believed this led to the rise in civilian casualties. Civilian deaths rose to over 600 in U.S.-led airstrikes in Syria and Iraq. Hypocrisy of western politicians and the media include obvious double standards when the Aleppo – Mosul situations are compared and contrasted. Warfa, Haq, Butler and Lavrov make excellent points from different perspectives regarding the innocent lives irrevocably lost and damaged. The reality is that mass civilian death toll is not a Mosul issue but a human issue. People of every country and faith should be concerned about the deaths of innocents irrespective of where they are occurring. Governments like the U.S. should have less concern for closing it borders to refugees and more concern for rendering life saving aid. Regarding Mosul, the question is what are world leaders going to do to eradicate the innocent loss of lives and war? It also remains to be seen who or what organization deems the Mosul catastrophe worthy of being shared with the world. To date, western media is not in the forefront of disseminating and sharing these truths.